This week we witnessed history in the making, the union of the most unlikely pair. The American President Donald Trump and North Korean leader Kim Jong-un engaged in the first ever summit between the two nations, wrapping up with a very vague joint declaration of security and peace. Using Crimson Hexagon, we had a look at the global conversations that were happening around the summit. Over the past month it was anyone’s guess as to whether to summit would actually go ahead, each media hungry leader wanting to have the final say. 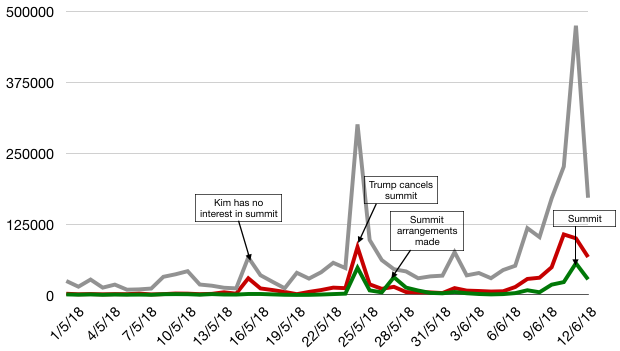 From the volume of conversations across all channels we can see that there were three key dates, the 16th of May when Kim declared he was not interested in proceeding with the summit, then on the 25th of May, Trump announced that he was cancelling the summit, but finally on the 12th of June both leaders descended into Singapore for the historic summit. Looking at the sentiment of the conversations, we see key peaks in both positivity and negativity. 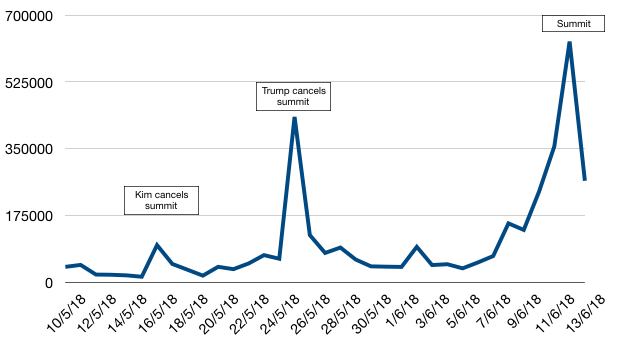 The first spike in negativity occurred on the 16th of May corresponding to Kim announcing he had no interest in the summit if it would be based on giving up nuclear. Trump decided to one up Kim on the 25th of May announcing the engagement was cancelled. Trump created three times negative volume after his announcement compared to Kim. The third peak in negativity was the 11th of June, the day before the summit, people were nervous about what The President may do in the following day. Overall people welcomed the idea of the summit, the announcement that it would in fact go ahead on the 28th of May created a peak in positive conversation. We see the big sense of relief on the day of the summit. The ‘thank goodness no-one blew up the world’ moment saw negativity decreased by 14% and positivity sharply increase. Positive posts, as pictured above, were predominately about patriarchal Americans congratulating Mr Trump on all his efforts in making this historical event. Similarly, negative posts focused on Trump’s failures before and during the event. If you haven’t seen the video released by the Whitehouse after the summit have a look here, it’s pretty special.